An introduction to the technique of drawn thread work. 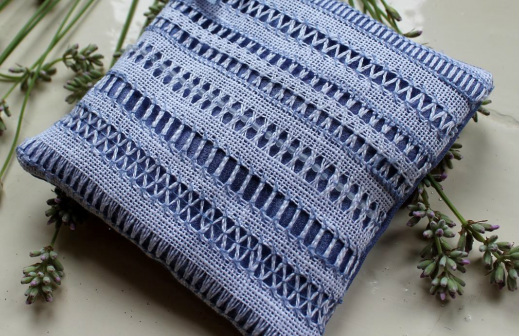 This is a very old form of open embroidery giving a pretty lace-like effect that lends itself well to this delicate little lavender bag. It is worked on pure evenweave white linen, then lined and backed with pure silk dupion. There is a choice of silk colours. Suitable for beginners to drawn thread work and for those who have some stitching experience. You will learn to cut and draw the threads of the white linen and to work several of the traditional stitches associated with this type of work, including one that incorporates beads (pictured at the top of the page). You should expect to complete at least 3 different stitches during the workshop, but will be shown more. Full instructions & materials will be provided for you to make your work up into a lavender bag afterwards. The work is completed without using an embroidery hoop.